Tea was brought tea in the brick form from China to the Japanese court in the early ninth century. The drinking of tea in Japan was confined to the court aristocracy and Buddhist ceremonies until the twelfth century when appreciation of tea spread among the warrior class. Tea gatherings of this era were often boisterous affairs that included contests in which participants identified various teas and prizes were offered to the winners. These were usually accompanied by liberal consumption of alcoholic beverages and gambling. Tea drinking became more refined in the fifteenth and sixteenth centuries with influences from the aristocracy and the newly influential merchant class combined with the influence from the basic ceremonial tea drinking in temples. Beyond entertainment, medicine or religious ceremony, tea drinking became identified as an act to represent the Zen belief that every act of daily life is a potential act that can lead to enlightenment. And so the tea drinking ceremony developed. The tea ceremony, or The Way of Tea, is meant to help us to do away with the discrimination that the ordinary mind makes: between man and nature, nobleman and commoner, priest and laity, beautiful and ugly, religious and secular. This is reflected in all parts of the ceremony from the location to the utensils used: The tea hut and the path that leads to the hut is meant to heighten awareness of man’s oneness with nature. Many tea huts are designed so that guests need to crawl through an entrance, no matter what position they hold in society. The utensils are plain and simple, allowing our minds to transcend any distinctions between beautiful and ugly. Distraction is discouraged. Everything about the tea ceremony is designed to bring the individual’s focus onto the Zen Buddhist concept of ‘living in the moment’ – and yet this does not mean the tea ceremony has to be a religious event. The tea ceremony embraces many art forms including architecture, gardening, ceramics, textiles, calligraphy, flower arrangement and food plus a few rather art forms such as the sculpting of ashes and the building of a beautiful fire. Everything involved in a tea ceremony has been given careful aesthetic attention, even the ashes. 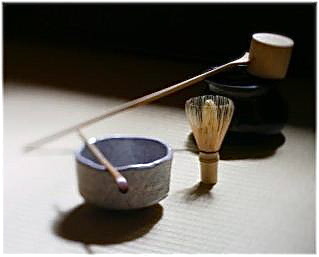 There are two types of tea ceremony in Japan, the chakai and the chaji. Both have the purpose of serving food and drink to guests. The difference lies in the quantity of food and drink, and the increased amount of ritualized movement that is necessary when you are serving. The chakai is an informal tea which consists of serving a sweet and some tea, or even a small meal with the sweet and tea, can take anywhere from 20 minutes to an hour or so. The number of guests for this sort of tea can be as small as one, and the highest number of guests is determined only by the limitations of the host’s facilities. The chaji is the more formal, involving highly structured gathering rituals, the serving of a meal in multiple courses, an intermission in a garden, and then a solemn thick tea ceremony followed by the less solemn thin Japanese tea ceremony. A chaji will last from 3 to 5 hours and only 5 guests at most will be present. Tea ceremonies in Japan have three main aspects: social, aesthetics, and spirituality. Social: The host will invite people who are compatible. There is no reason to sit down with enemies to share this moment. Aesthetics: Food should be tasted with the eyes before it is tasted with the mouth. The appearance of the food, the utensils used in serving the food, and the decoration of the eating-place should look appealing. Body movement is completely choreographed, even down to finger positions. This attention to appearance is so important in the tea ceremony that the ceremony is called an art form. Spirituality: The Zen Buddhist religious dimension of the tea ceremony is optional, but the benefits of the influence from Zen Buddhism are integral to the ceremony. Zen Buddhists suggest the whole universe can be experienced in the drinking of tea. This experience comes from allowing yourself to be completely present in the here and now and fully participate in the tea ceremony, free from distraction or discrimination. The ideals in the Way of Tea are known in English as Harmony, Respect, Purity, and Tranquility. Any religion can understand and take part in the contemplative qualities of the tea ceremony. The host begins by cleaning the serving bowls and boiling a pot of water. The hosts then serves a sweet treat to guests before the tea, mixes the powdered bitter green tea (Matcha) with water to make a frothy tea, and serves this to the guests. The flavors of the sweets and bitter tea are meant to compliment each other, as a symbol of harmony. The guest bows when he or she receives the cup of tea, or chawan, and takes the chawan with the right hand then places it in the palm of the left hand. The chawan is then turned clockwise three times before a drink is taken. When the tea is gone, a loud slurp tells the host that the tea was enjoyed. The guest then wipes the part of the chawan that touched his or her lips with their right hand and then turn the chawan counterclockwise to return it to the host. It takes as long to learn the tea ceremony as it does many art forms—if you’re a fast learner you could learn the basics in a few weeks. If you want to really master it as an art form then expect many years. To perform the tea ceremony as true art, it will need to appear so subtle that it looks completely natural and not at all contrived. The Way of Tea, is a cultural practice that encompasses every aspect of life: art, religion, philosophy, and social life. Few if any other practices in the world can compare to the tea ceremony for its creation of an holistic and non-discriminatory experience, allowing the host and the guest to truly experience living in the moment.